I'm not certain if this image, shows the flag of . I saw this flag on December 23, 2014, but I'm ot sure if it is the flag of the airport , or the flag of the Aruba Airport Authoirty (the management entity). 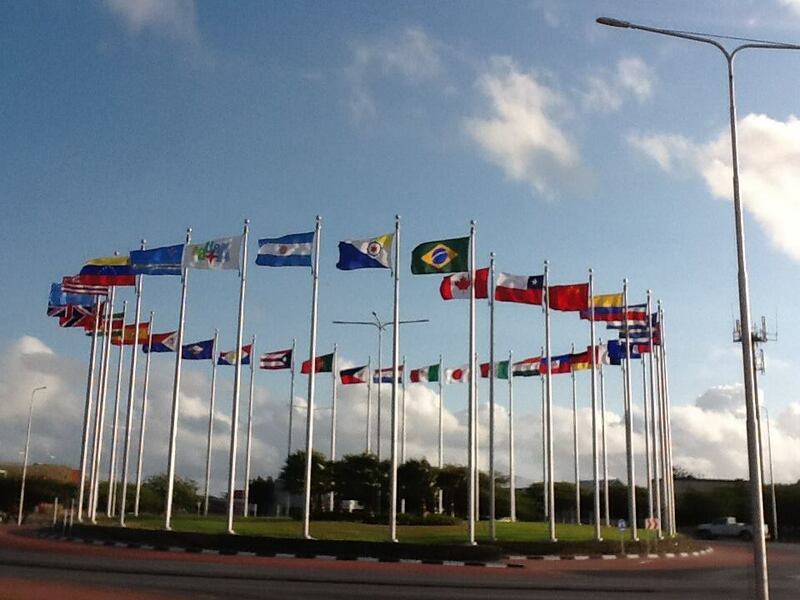 The flag in question is that of the Aeropuerto Internacional Reina Beatrix on Aruba. The flag I think is that of the airport, is the flag right of the flag of Venezuela (actually tow flags to the right). To me, it seems this blurry image shows the logo on a white horizontal flag, but again, I may be wrong, so if someone can help me on this one I'd appreciate it very much. 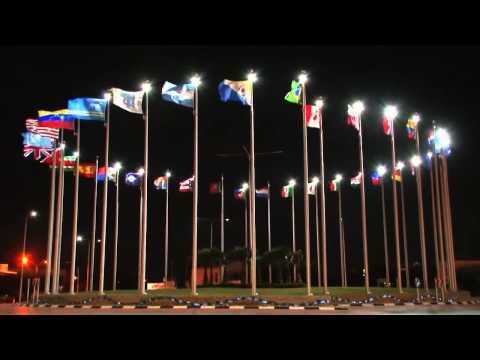 While I'm not convinced that this flag is for Aruba Airport Authoirty on that picture, I started to search for it, because I remember for this picture, I have seen it somewhere, but in daylight condition. Even I downloaded it at that time, but I don't remember where I can find it, possibly it comes from Facebook. It is Aruba Tourist Logo Flag, a white flag with coloured name of the island and its four-pointed star symbol. When I searched the flag you giffed, it came up as "Aruba" and a slogan ("One happy island") claiming to be the ATA (Aruba Tourism Authority), so I guess it is a government flag (in fact, when looking at the official government of Aruba website, one can see that they link directly to ATA in Dutch. Now reading further information, I came to this: "As of January 1, 2011, ATA has evolved from a government agency to a unique independent legal entity within the public sphere. The Aruba Tourism Authority (A.T.A.) is the Destination Marketing and Management Organization (DMMO) for Aruba responsible for uniting tourism interests amongst the on- and off-island stakeholders/partners for the purpose of coordinating destination marketing, destination development and destination partnerships." So indeed, the flag you drew is of the ATA (Aruba Tourism Authority).